Yes it's that time of year, usually means little to me now except a silent chuckle. This year the two first grandchildren, Cian and Donnacha, are starting school, today and tomorrow, so it is special. One of the nice things that has happened at our Knightsbrook readings is the number of residents who read with us. This has grown as the weeks pass and last week I think I only had to read four poems. One resident does a lovely rendition by heart of this Wee Hughie poem by Elizabeth Shane. Most suitable for the day. The material for Boyne Berries 10 has been selected and is with the printers. We await the first proof. Because this is issue 10 we decided to change the format so instead of the simple, unadorned Boyne Berries we usually see, this is to be larger, colourful and contain illustrations/pictures/graphics. So lots more work to do. The launch date has been fixed. Two launches actually, the first as usual in the Castle Arch Hotel, Trim on Thursday 29 September at 8pm. 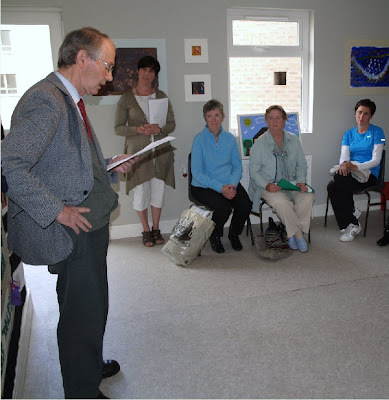 Peter Fallon, poet and publisher, had kindly agreed to officially launch the magazine for us. The following night we launch in Galway, in Charlie Byrne's Bookshop at 6pm. Kevin Higgins will perform the honours there and we look forward to seeing all our Galway and neighbourhood contributors, past and present. All welcome to either or both launches. Contributors will be present and will read from the magazine. I attended the preview of the Carty escape Magamedia drama/documentary for TG4 in the series Ealú which is about prison escapes. It took place in the impressive Cinema North West mobile facility in the yard of Sligo Gaol last Monday. It's interesting to see how such programmes are put together. Three or four 'experts' were interviewed and their interviews were cut and jig sawed together to make a more or less coherent account. There was also a narrator, someone with one of those authoritative voices which carries the ring of truth about it. Then there was the reconstruction. Very effective though quite simple. Some shots of a prison wall, rope ladder being thrown and falling, men running in a yard. Nicely filmed sequences of the overpowering of a guard, of the waking of the governor and the taking of the keys and the opening of Carty's cell. Also some nice shots of a small IRA column moving in the mountains, crossing picturesque streams etc. All expertly put together in a coherent story. I was surprised by how close-up my filming was - though maybe this was just the effect of the big screen. I was pleased that my Irish seemed OK and I didn't spot any glaring grammatical mistake. Nor indeed any glaring historical inaccuracy. Paddy Hayes, the series director introduced the programme in Sligo and stressed that this was a jailbreak, a rescue not just an escape. Billy Pilkington, the Sligo IRA O/C planned and carried out the rescue. It's ironic that Carty and Pilkington didn't get on well afterwards though both took the anti-Treaty side in the civil war. Pilkington became a Redemptorist priest afterwards and spent most of his life in South Africa. Carty joined Fianna Fáil and became a TD. I don't know when the programme will be shown, sometime in this autumn or winter. Watch the TV schedules! A great visit to Sligo Gaol, or what remains of it, on Monday. Quite a lot remains actually. Some parts have been converted to modern offices inside with the outside stonework repointed and very well maintained. Other parts especially the cell block have been left exactly as they were when it was closed in the fifties. You can walk in through the corridors and cells and get a feeling for what it was like - gloomy and claustrophobic actually. 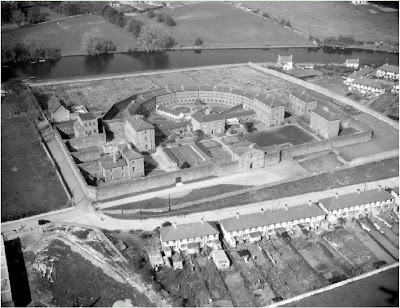 The Gaol was built with a central Governor’s House from which the cell blocks, which formed a semi-polygon on plan, could be observed. See picture in a previous post. Within its high boundary walls there was separate accommodation for men and women, criminals, lunatics, and debtors. 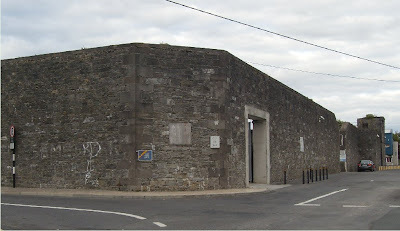 It was built around 1814-1820 and must be the finest surviving gaol of its time in the country. The Governor's house still stands, see picture above, and to the left the front three storey end section and much of the left-hand side two storey blocks. Most of the structures to the right of the governor's house are gone. A conservation plan for the Gaol was launched on Monday by Sligo County Council and some work will start very soon. 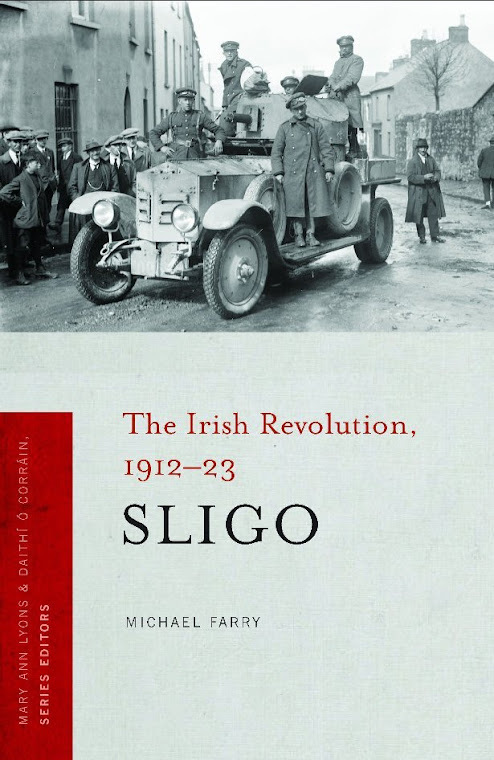 Michael Collins and Sean MacEoin were imprisoned there during the war of independence and of course Sligo IRA leader Frank Carty was rescued from the jail in 1920. The TG4 Magamedia programmes on the escape in the Ealú series was premiered in the Gaol grounds on Monday. More on that later. 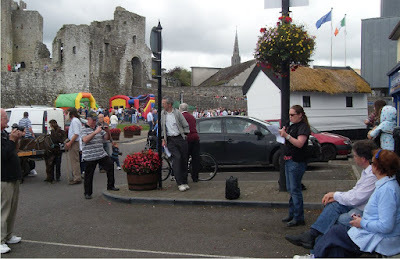 A very enjoyable day in Trim on Sunday last celebrating the Walled Town and Heritage Week. Jousing on bicycles, fencing, stilt walking, irish music, bouncing castles, an Elvis impersonator, dancing, pig roasting a Redcoat looking for rebels etc etc. And poetry and prose. Members of the two Trim writing groups, The Meath Writers Circle and the Boyne Writers Group in perfect harmony, read poetry and prose. In the welter of activity they didn't attract all that much attention but those who did listen were treated to a piece from Paddy Smith especially written for the occasion about town walls and taxes and tolls. Tommy Murray read from his newly published Famine Trilogy and Paul Kerr, James Linnane and the Sheriff from Navan also read. Above Orla Fay reads some of her poems on notable landmarks including Newtown Abbey. Today, as part of Heritage Week 2011 two of the TG4 documentaries in the Ealú series with sligo connections will be screened at Sligo Gaol by cinema North West. The Linda Kearns programme has already been shown on TG4 but the other, about Frank Carty's 1920 rescue from the jail, will be shown for the first time. It will be aired sometime in the autumn. I was interviewed as an historian for the Carty programme and I've been invited to the 5pm showing. I'm looking forward to see how my Irish sounds and which bits of my interview they included. 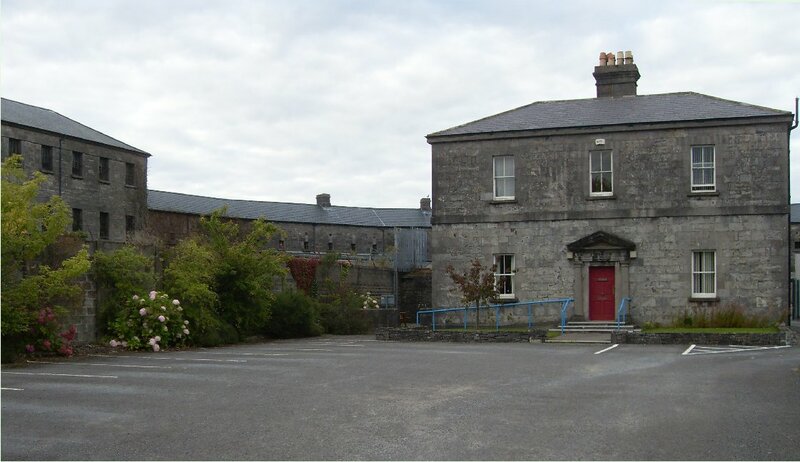 The 5pm event will also include the launch of the County Council's Sligo Gaol Conservation Plan. I have to admit that I have never visited the gaol but it seems there are substantial parts of the jail still in reasonably good shape. I'm looking forward to seeing the wall the rescuers climbed in 1920, a long wooden ladder to get on to the wall, a rope ladder to get down inside. Screenings will take place at 1pm, 3pm, lasting 50 minutes in total and suitable for a general audience . Aof the Frank Carty story only will also take place at 5pm on Monday 22nd August (duration 25 minutes and GA). 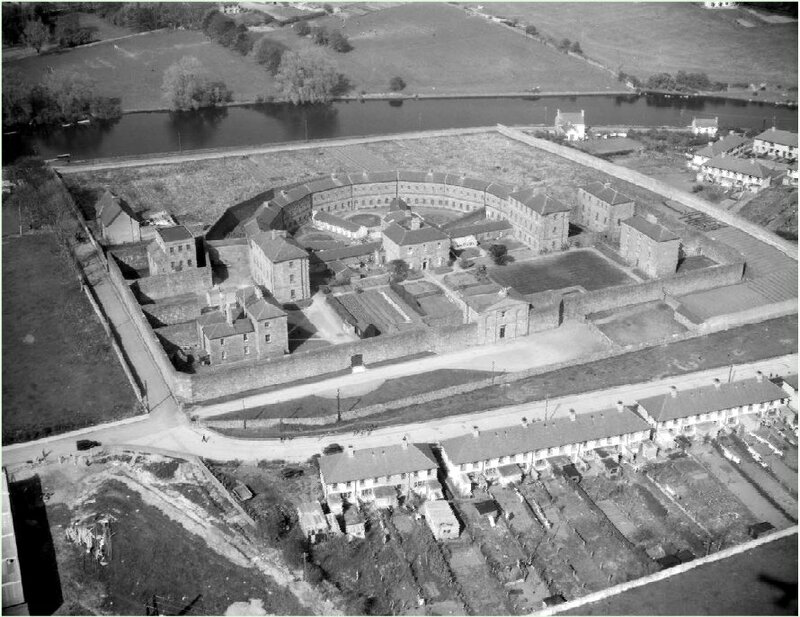 Top: Aerial photograph of Sligo gaol 1947, photo National Library of Ireland. The LitLab reading at the Art Space, Bullock Lane yesterday went very well - a quiet space in the middle of a lot of loud music and huge crowds. The venue is small but at one o'clock it looked like there would be more readers than audience. However an audience assembled two by two and by the time we were in full flow there was a respectable number present. Six LitLab members and two others read. A respectful, responsive audience enjoyed the content, laughing and remaining silent at appropriate places. 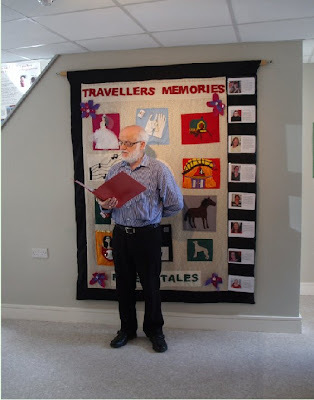 We had a short story, a prose piece poking fun at Wordsworth, writers' groups, poetry criticism and a LitLab member and poems about Tara, travellers, swallows, crows, water, climbing mountains etc. An exhibition is currently on display in the Art Space entitled Traveller’s Memories Pavee Tales and the artwork provided a suitable background. Full details of the exhibition here. Another LitLab reading today in the same venue at 1pm. 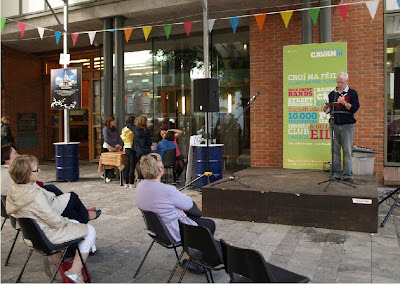 Tomorrow back to Cavan for more poetry as part of the LitLab's contribution to the Fleadh. This time indoor, no live feed I presume, at the Artspace, Bullock Lane, just off the main street in Cavan town. This is an intimate space perfectly suited for events like this. Don't know how many will be reading, five or six probably with an invitation to audience to join in. And on Sunday there's a Town Walled Town Fun Heritage Day. We have been asked to do a short reading, not necessarily poetry, even though we don't seem to appear on the programmes. The other group based in Trim is also reading I understand. I'm looking for something suitable to the town, walls etc theme. More pictures from yesterday's event which was briefly, very briefly, featured on RTE news bulletins at 6 pm and 9 pm yesterday. Above Tony, below myself. 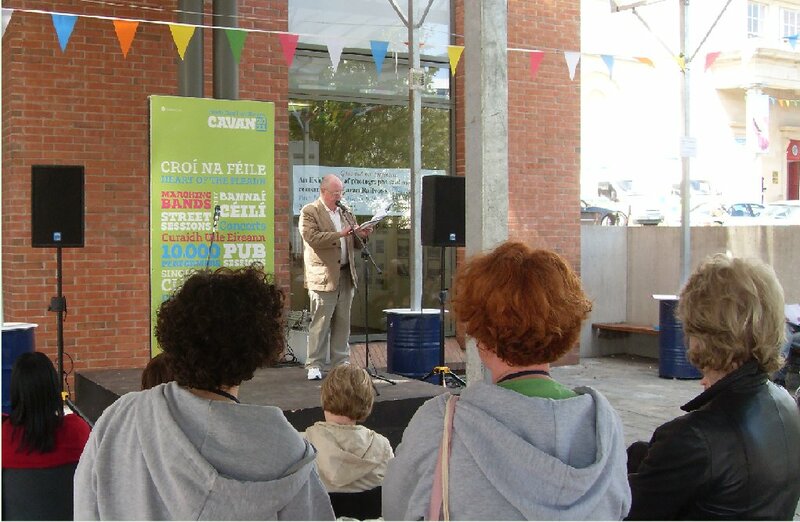 Just home from Cavan Fleadh where LitLab read poetry at the stage at Farnham St. Library from 1 to 2pm. Very enjoyable session. Three of us read, Paddy, Tony and myself and we were assisted by a number of audience members who read favourite poems. 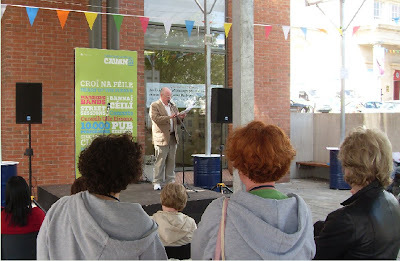 Also a Cavan poet, P.J., was passing by and recited two of his own poems by heart. Very impressive. The very energetic Cavan Arts Officer, Catriona O'Reilly was there and as well as encouraging audience participation she read some of the LitLab postcard poems (picture below). An appreciative audience, some sat on the chairs and benches and stayed for the whole hour, others drifted in and out as they passed by, got interested and then left for work or something else. 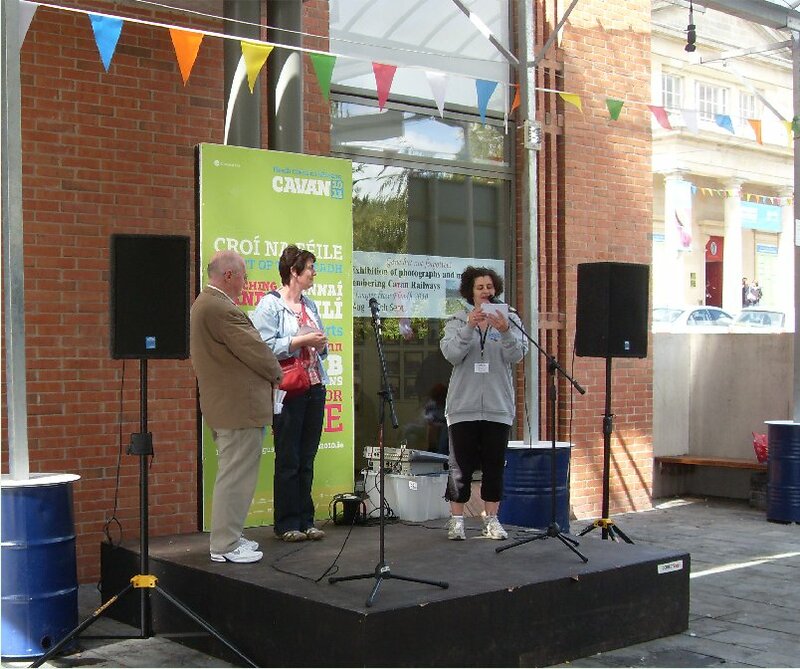 Nice to see Heather Brett, the Cavan poet, who has been associated with LitLab for some time in the audience. I began the proceedings with The Lake Isle of Innisfree and continued with my own poems. Paddy read classic poems and finished the session with his current favourite The Owl and the Pussycat (picture above) and Tony read a number of his poems. The set up was great - a large stage in a covered area in the open space outside the library, with benches and chairs for listeners. A very good sound system ensured that everyone passing by, walking, in cars and on the other side of the street heard something of what was going on. A particular bonus was that fact that proceedings were being streamed live on the internet so I texted my daughter in Perth, Australia and she watched her Dad read in Cavan. Most of the session is now available here on the website of CavanTV. Check the two latest videos under the live feed. I'm the person in blue. There is a nice cosmopolitan feel to the streets of Cavan at the moment with visitors there from many parts for the week. Next Saturday and Sunday LitLab are reading again, this time in the Arts space, Bullock Lane, just off the main street, 1 to 2 each day. I'll be there on Saturday. More picture from today later. 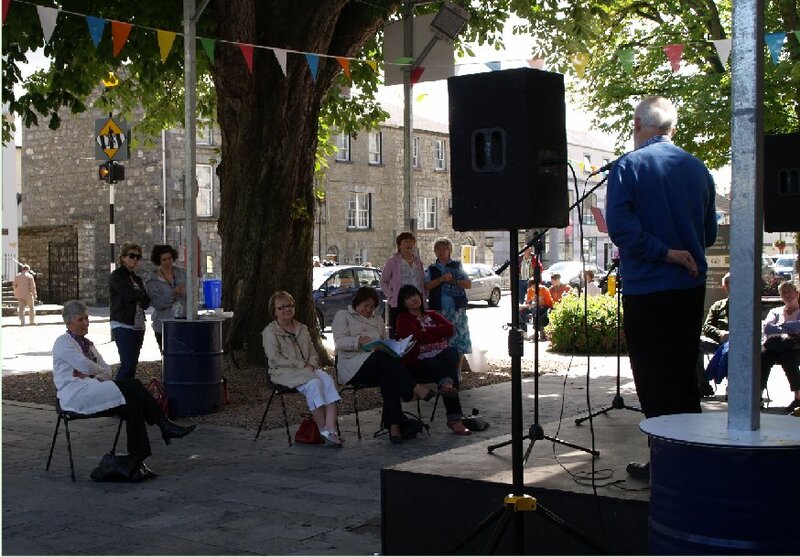 Our Meath/Cavan writing group, LitLab, is taking part in a number of events in this year's Fleadh Cheoil na hÉireann in Cavan. Last year in collaboration with Cavan Arts Office we produced a set of coasters/beer mats which had haiku from members of the group. This year the coasters were reprinted and are being distributed free to hotels and pubs. 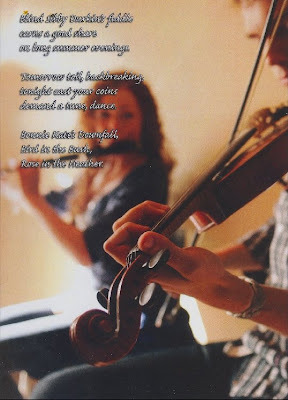 This year we have produced a set of ten postcards for the Fleadh with short poems from LitLab members and photographs and artwork. The postcards are being distributed free to hotels, shops etc in Cavan and environs for the Fleadh. Mine is pictured above. I found a reference somewhere in my research to a blind nineteenth century woman called Sibby Durkin who lived near Coolaney and earned money by playing the fiddle. So this little poem remembers the long gone fiddler. The picture is by Desmond Connors. LitLab members are reading at the Johnstown Library Bandstand on Monday and Tuesday from 1 - 2pm. Poetry, prose, our own and classics, whatever seems most suitable I suppose. Audience participation welcome. We also will read in the Schoolhouse in Cavan town on Saturday and Sunday, again 1-2pm. Our garden never looks at its best this time of year. It will be OK in a few weeks with Rudbekia and Japanese Anemone in bloom but there's a gap at the moment. The woodbines are in full flower and the climbing roses just fading. 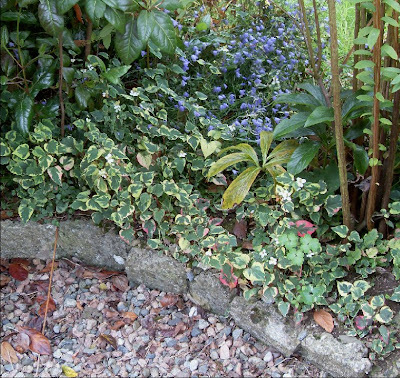 The trick is to look for the small hidden things like the Harebells and Houttuynia above. 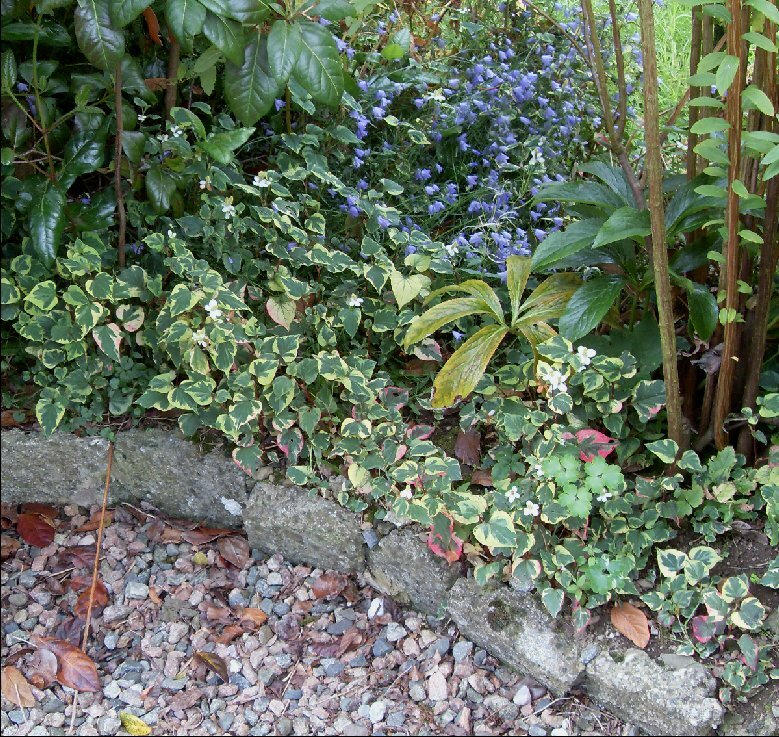 They grow and expand year after year with little care or attention. My kind of flowers! I managed to attend one session of the Yeats Summer School in Sligo and heard two interesting lectures on early Yeats. 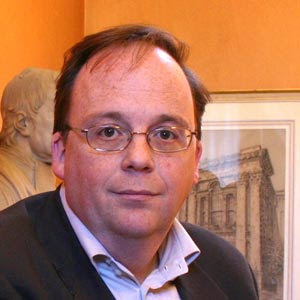 Peter McDonald of Oxford University lectured on Yeats's Juvenilia. He started by asking Where/When does a poet begin? Some very early and he mentioned Wordsworth, Tennyson, Shelley and Pope as prolific teenage poets. Others write a lot in their youth which later is rightly forgotten. This is what is usually classed as juvenilia. He wondered why there wasn't a similar name for poetry produced at the other end and did say that in Walter Savage Landor's 14 volume collected works there was a section at the end called senilia. Leigh Hunt called his debut collection Juvenilia with the subtitle a Collection of Poems Written between the ages of Twelve and Sixteen. There is no juvenilia section in Yeats just some carefully winnowed works of youth in the early books. A poet starts with another poet, McDonald said, meaning that poets write under others' influences until they find their own voice. And he looked at the poets who influenced Yeats from the evidence in his first published poem The Island of Statues and early versions of Oisin. Spencer, Shelley, Tennyson are the great influences at this time. The lecture ended with the admission that most of this early work by Yeats is not of great quality and of interest only to the scholar and that there is no answer to the question posed at the start. Yeats' first play, Love and Death, 1885, previously unpublished has just been published by Boston College on the internet and a reading was given at the Summer School. 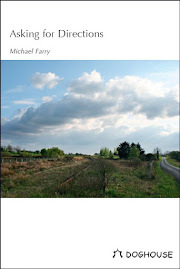 Peter McDonald is a poet himself and his recent volume Torchlight is reviewed here. I didn't have time to attend Peter's poetry reading or the Yeats play reading. History called. Note to self : After the book is finished attend at least one week of the Yeats Summer School. The submission deadline is over, the submissions are with the readers and decisions will be made in the next two weeks. Those whose poetry or prose will be included in our special Boyne Berries 10 will be notified before the beginning of September. The launch will be in the Castle Arch Hotel, Trim on Thursday 29 September at 8pm and all contributors will be invited to attend and read. For the first time ever we will have a second launch, in Galway in Charlie Byrne's Bookshop on Friday 30 September. We hope contributors from the west, and others will be able to attend that event which starts at 6pm. At the moment we are finalising the design of the magazine which will be different to the usual black and white spare design. Boyne Berries 10 will have colour and photographs and artwork but the emphasis will be as usual on the poetry and prose from Meath, Ireland and the world. a nice selection of submissions from all over the world as usual. The man at the Sligo cafe checkout looked at me and made a choice. Here for the races? No, I told him, for the football, disappointed with his choice. Yesterday Sligo town was busy. An evening race meeting (ladies' day), and a European soccer match. 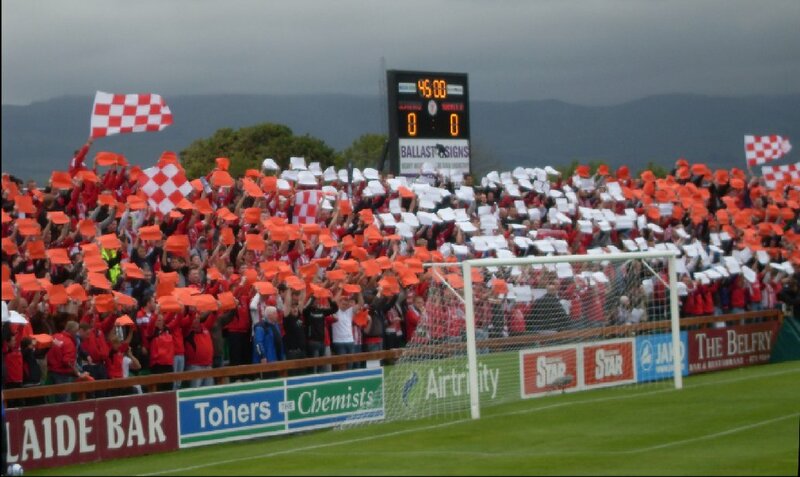 The Showgrounds looked great, a new stand, fresh paint, a perfect pitch, flags, a full house, lots of excitement. Not many Vorskla Poltava supporters unfortunately but it's a long way from the Ukraine. There was a small group in the main stand who made lots of noise when they scored. We also had someone from there to read out their team list which was good. And there were commentators in the press box who got very excited I'm told. It rained earlier but stayed dry for the match so neither Knocknarea nor Benbulben was visible both bundled up in clouds. And the result. Two quick goals for the visitors after 15 minutes spoiled the party. 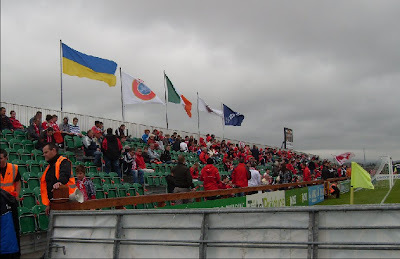 There was a clear difference in class and Vorskla Poltava's quick crisp passing often left Sligo chasing shadows. Rovers did have chances and gave a good account of themselves after the two goals to keep the score respectable. Vorskla Poltava's website is here, English version. 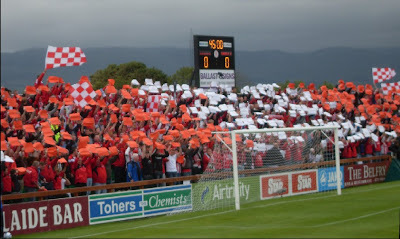 No report from Sligo there yet but they have pictures here. Jessica's report is on extratime.ie. Top: Rovers welcomed on to the field. 1. Vorskla Poltava arrive at the grounds. Second from left is Sergei Zakarlyuka who scored their first goal. 2. Flags, including that of Ukraine, fly at the Showgrounds. 3. 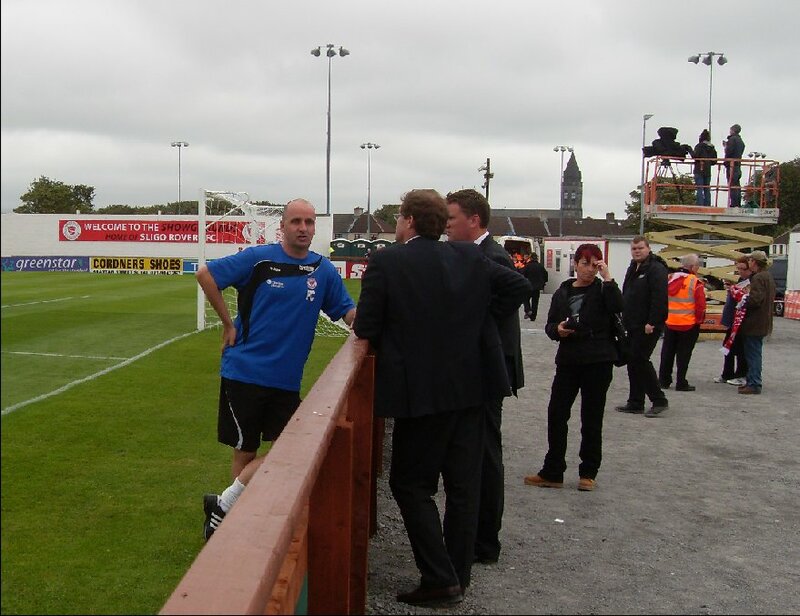 Manager Paul Cook relaxed before the match. Just back from a most enjoyable exhausting few days in Sligo. I attended a lecture on Sunday night at the Ballymote Heritage Weekend Eva Gore Booth, Champion of the worker by Cllr Ruth Illingworth from Mullingar. A most informative talk by an enthusiast. Eva is the gazelle in Yeats' poem In memory of Eva Gore Booth and Constance Markiewicz. Eva spent most of her life in Manchester working for women's right to vote and the betterment of women workers. Some good touches in the lecture especially contrasts between the attitudes of the two Gore Booth sisters and the difference among suffragettes on questions like attitude to the war and attitude to the female working class. No slides, no illustrations though and I would have liked to see some of those paintings and pictures of Eva. Still enjoyable. Monday morning I attended two lectures at the Yeats Summer School. Again no slides just academic lectures. More about them later in the week maybe. And Monday night was my turn. I was worried having seen three lectures none of which had used any slides or display. My lecture relied heavily on pictures and text in a presentation. some great, never before seen in public pictures from the Bedford Archives at that. A good crowd attended and seemed to enjoy the talk. I think it went on for an hour and half - good thing I cut it out ten slides last week! Lots of people came up afterwards to congratulate me and tell me things they knew, some of which I didn't know. As a result I have got copies of an Sligo IRA battalion account book from 1921-22, an autograph book of IRA prisoners - including some Sligo ones - in Crumlin Road jail Belfast in 1920-21 and some extracts from a diary of 1920 telling what it was like in south Sligo then. Great stuff! More work! A relief when it was over. 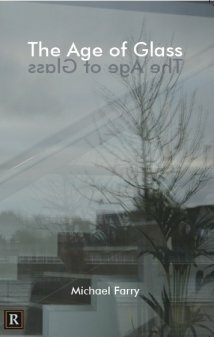 A visit to Sligo Library today - some nice photographs - then home. Submissions for Boyne Berries closed, now to start the selection process. And the BOOK, always the BOOK. The good news is I may have managed to get a ticket for the game on Thursday!! My favourite niece! !